Would The Real Ed Dale Please Stand Up? About six years ago (or more), I had been talking with Brett McFall, the Australian copywriter, and he invited me to attend his upcoming Ad Camp workshop. It was one of those weekend “make a million dollars” workshops (I loved attending these back in the day) but unfortunately I already had plans. I said “I’ll do my best to be there” but didn’t even think I’d make it. Anyway, in the end, I arrived on the last half, of the last day and I remember stepping into a dark and dingy seminar room with a little tubby nerd up front. I can almost hear him now. He was talking about building niche websites, fly capture pages, Google Adwords and a whole host of other topics I’d heard a few people share before. At the time this was cutting edge material and, looking back now, I was there at the beginning. 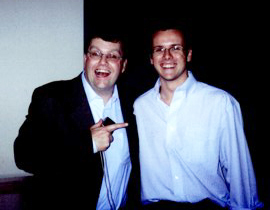 This was actually the start of what would later become the hugely successful Under Achiever Method and the tubby nerd upfront was none other than Ed Dale (www.tubbynerd.com). At the conclusion of his session I had a chance to chat with Ed in greater detail and it was obvious he was the real deal… i even and took a photo to mark the occasion (see right). Over the years I’ve been fortunate enough to stay in touch with Ed. I’ve purchased his courses, attended his seminars, and consulted with him on many occasions. In short, I love Ed’s stuff. With such an extensive history, I thought it was high time I record one of our conversations. He was only too happy to help out and it’s with great pleasure I give you the recordings from a conversation we had last week. We talked about market research, market leadership, adding value and that’s just the tip of the ice berg. Once you’ve had a listen… let me know what you think. What’d you learn? What was your biggest take away? I’d love to hear from you – comment below. PS. If you enjoyed this MP3 download, be sure to click here to follow me on twitter. I’ll keep you updated as I keep posting more cool stuff. PPS. Are you going to Ed’s Melbourne seminar? I’ll be attending… I’d love to see you there, be sure to come and say “hi”. Hey David, I am coming from Florida hoping to find my path in this whole crazy business. I believe this Seminar is going to head me in the right direction. Lord only knows i have been trying to find my solid path for some time now. been trying to focus on one direction, but getting pulled i every direction. Thanks for stopping by… Looks like while you’re coming here, I’ll be coming to you (I’m actually off to Florida on the Sunday of the seminar). Anyway, looking forward to meeting you in person.